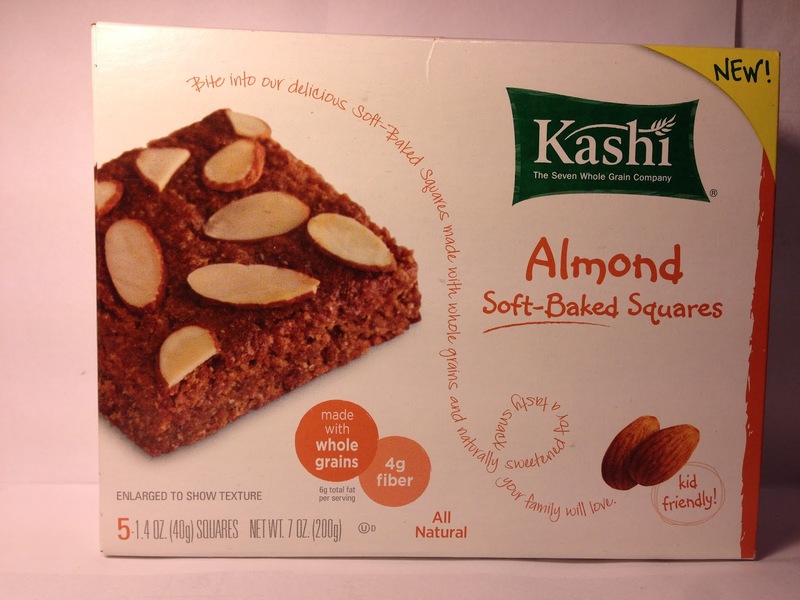 I've been hard on Kashi products on the blog, but last time I reviewed one of these soft-baked squares, it wasn't bad, but I was also not overly impressed either. Since the last square that I tried was a free sample, they sent along a coupon to get $1.00 off a box of these at the store, so on my next trip to Meijer, I saw these Kashi Almond Soft-Baked Squares on sale for $2.99 and with my coupon, I was able to get a box of five of these for $1.99. What a deal! 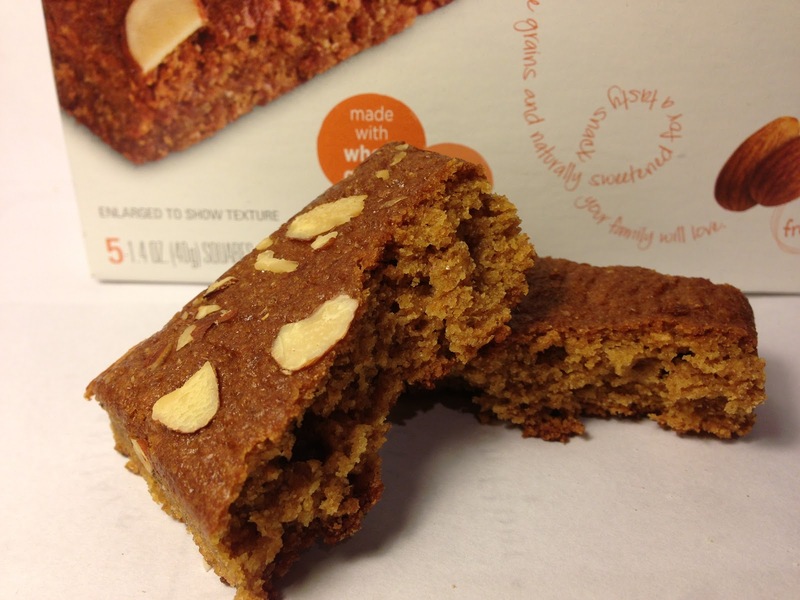 My bargain shopping aside, each soft-baked square comes in at 1.4 ounces and has 160 calories and three grams of protein. Last time I reviewed one of these squares, a visitor left a comment on the post that hammered me for comparing it to a brownie. When a product is soft, baked and looks like a brownie, I'm at a bit of loss as to what to compare it to, so I'll compare this one to a brownie as well in terms of how it looks. Now, this one looks more like a blondie than a brownie, but the one aspect that it shares with both of those is that it does have that baked appearance, which is good since that is what this bar is. It's also quite flaky and falls apart easily, so based on prior eating experience, I could be led to believe that this would be quite dry and I'm not particularly fond of that in my baked products. One other thing I'm not particularly fond of is when a box advertises a product that is covered in a particular ingredient, but when you open the wrapper, that particular ingredient only covers half of the bar, if that. Since I'm complaining about it, that was obviously the case with this square and what almonds there were on the bar were of the saved variety, so it's not like I was going to be chomping my way through this bar like I had hoped. In terms of the smell, those shaved almonds (and the almond powder in the baked mix) also gave a strong odor of almonds. It was so strong, in fact, that it was almost nauseating. When I took my first bite, my visual observations were proven out as this bar was exceptionally dry and difficult to chew through without any sort of fluid to lubricate my mouth. After being able to chew a bit, I tried discerning what the sweetness in the bar was coming from and upon review of the ingredients, I found that this bar included sweet potatoes. Huh?! I guess that's where the semi-orange coloring may have come from, but I can't say I've had many baked products that have sweet potatoes as an ingredient and if this is what they taste like, I'm not too anxious to have any more of them as it was basically a flat taste with a bar hint of sweetness. As for the taste of the rest of the square, I'd love to be able to wax poetically about it, but that would require it to have had some taste. There was a slight hint of almond taste from the pathetically spread shaved almonds, but all in all, this bar was a soft-baked square of nothingness. Buy It or Fly By It? Kashi did succeed in this square with the fact that it was soft, it was baked and it was square. Outside of that, this was a terrible product and I give it a FLY BY IT rating. Food is supposed to taste like at least something and being that this pretty much failed to fulfill that basic requirement, I can't say this is worth anyone trying. I'm just upset that I have four more of these to eat, so even though I hate to waste food, the remaining squares may meet the ol' trash can before all is said and done. I just bought my first box. My 16-yr old daughter and I think they are GREAT! We want to figure out a way to bake these at home!